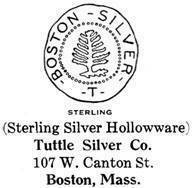 Tuttle Silver Company was founded by Timothy Tuttle in the year 1890 in downtown Boston, Massachusetts. The company was later bought over by Wallace Silversmiths in the year 1958 and subsequently by by Syratech Corporation. Early works are difficult to identified. There is no adopted date mark on their manufactured pieces or articles. In fact, the company begun with copying English Sterling silver pieces. Each piece is made to order. The company adopted a date mark hallmark that is represented by crescent and abbreviation of the current or incumbent American president of that year. For example: Calvin Collidge is represented by CC from the year 1923 till 1929. This mark is commonly called the presidential date mark by Tuttle. Below the crescent, collector can normally find a Number or roman numerical mark. 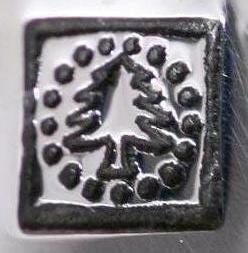 This mark identify the year of president that the silver article was manufactured.